You can use the "Report Submission/Response" link (below the cover art) from any of our listings (recommended), or you can access the report response tool directly. (2) Honestly report your rejections as well as acceptances to avoid skewing the response statistics we maintain for all users of this site. (3) Report a submission per piece (not a submission per batch of pieces). 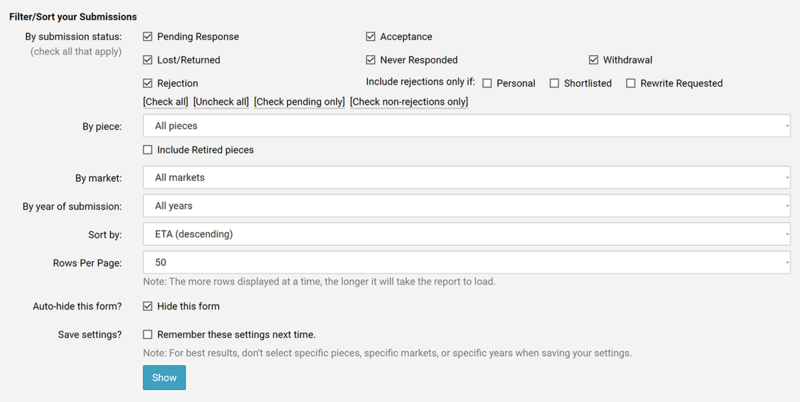 You will need to select the market from your search results (if you used a "Report Submission/Response" link from a listing, you will skip this step). Please be aware that we list many projects with similar titles. Be sure to report your submissions under the correct listing. Using the "Report Submission/Response" link from the listing helps avoid any confusion. If the market isn't listed, let us know about it and we will add it (if it qualifies for a listing) as soon as possible. What Piece(s) did you submit? You will need to select the title(s) from your "pieces list." Adding a piece: If the title isn't already in your "pieces list," you can add it either by using the "I need to add a piece to my list" option (be sure to click the "Add and Continue" button after entering the information, and then finish entering the details of the submission), or by going to your List of Pieces and adding the piece there. 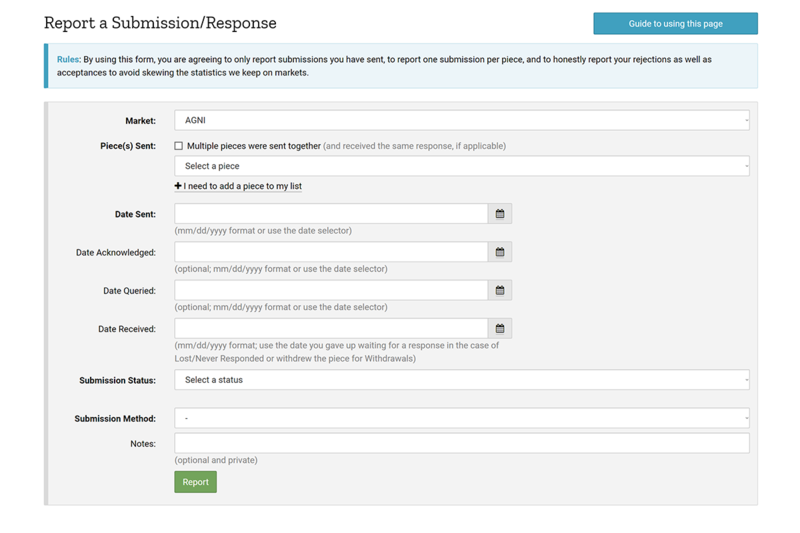 Submitting multiple pieces at once: If you are submitting more than one piece to the same market with the exact same dates and other details, you can choose the "multiple pieces were sent together" option and use ctrl-click (cmd-click on Macs) to select each title from your list, or you can submit them individually if you prefer or if you don't meet all the criteria for the multiple pieces option. Note: When submitting Collections or Chapbooks, select the title of the collection or chapbook as the Piece; please do not select each individual piece in the collection/chapbook. However, if you are submitting multiple individual pieces, please do select each piece being submitted. You will need to enter pertinent dates in US format (MM/DD/YY) or through the drop-down calendar. Sent date: For all submissions, enter the date you sent the submission. If you have received a response, then enter the date you received a response. If you are entering a withdrawal or lost/never responded submission, then enter the date you withdrew the piece or the date you gave up waiting for a response. If you are still waiting on a response and are not reporting it as lost/never responded, then leave the Date Received field blank. Acknowledged date: Optionally, you can enter the date you received acknowledgment of your submission. Status Query Sent: If you have sent the editor/agent a query about the status of this submission, you may enter the date in this field. If you are submitting to an agent, you may also enter dates for when partial and/or full manuscripts were requested by the agent and sent by you. Indicate whether the agent requested "exclusive" consideration of the partial/full manuscript. Pending response: When you have not yet heard a response on a submission. You will be able to update the status of this submission as needed through your Submission Tracker. For agent submissions, this is "Pending Final Response." To track intermediary steps in the agent submission process, enter the pertinent dates for partial/full manuscripts. Acceptance: Congratulations! Your piece has been accepted for publication. For agent submissions, this is Offer of Representation. O, frabjous day! Lost/Returned: When you have learned that your submission has been lost (i.e., you have learned that it was never received) or returned to you (i.e., the editor/agent is not reading submissions now). You will need to enter the date you discovered that your submission was lost or returned as the date of response. If you resubmit the same piece to this market, please enter the resubmission as a separate report. Never responded: When you have given up waiting for a response. The system will not let you use this status if it is still within a normal period of time for that market to respond. You will need to enter the date you gave up waiting as the date of response. If you resubmit the same piece to this market, please enter the resubmission as a separate report. Withdrawal: When you have contacted the editors to withdraw a piece from consideration, generally because it was accepted elsewhere first. You will need to enter the date you withdrew the piece as the date of response. Please do not abuse this option; if your piece was actually rejected, do not mark it as "withdrawn" as that significantly skews the statistics for everyone else. Shortlisted: Use when you have learned that your submission has been shortlisted. This is only available as an option for Pending responses and Rejections. Rewrite Requested: Use when the editor has specifically asked you to rewrite/rework the piece and resubmit it. With rewrite requests, we prefer you to enter the rewritten piece as a separate submission. This is only available as an option for Rejections. Electronic: Any type of electronic submission, such as email or online forms. Postal: A physical submission sent through the mail. Submission Manager: A submission sent via a third-party submission manager. Several fields will be listed under the "Optional Information" heading. These will vary depending on the status and type of the submission. For example, you can track submission fees paid, as well as payment and publication details for pieces accepted for publication. Enter the total fee you paid for all pieces submitted in that batch (at the same time to that publication/contest) and select the correct currency. Please do not include any postage paid or the cost of any separate purchases you made at the same time; only include submission fees that you paid to the publication/organization. When submitting to a contest, be sure to report the submission under the contest's listing, not under the parent publication's listing. Enter a zero if you did not pay a fee. Finally, submit the information, and it will be added to your personal Submission Tracker. Be sure that you receive confirmation of the submission report, and check for any alerts on the page indicating an entry error. Your personal Submission Tracker includes information on all the submissions — pending and completed — that you've reported to us. 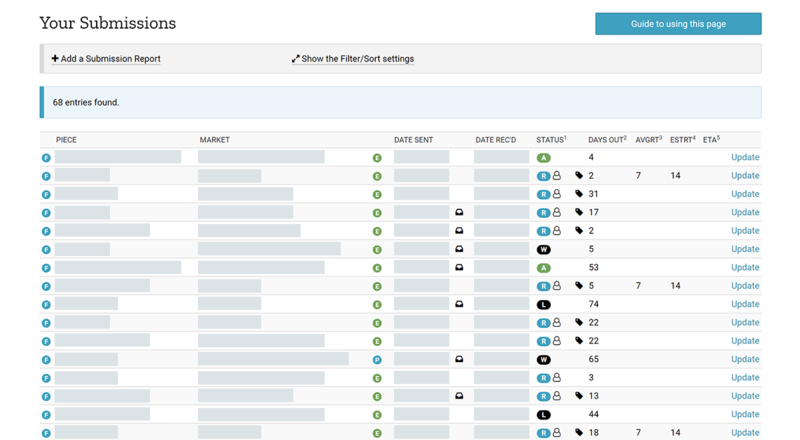 You can choose how to sort your list by using the "Sort by" setting, and you can choose how many to display at a time using the "Rows per page" setting. If the filter form is taking up too much space, use the "Auto-hide" option. If you want to have your settings remembered indefinitely, be sure to use the "Save settings" option. For your pending submissions, your report displays how many days have passed since you sent the submission, how many days on average it takes for that market to respond (if we have the information), and the editor's requested minimum number of days that should pass before you send a query (if known). Pending responses will also be color coded to help you determine when it might be appropriate to query the editor or update the status of the submission. P It is probably too early to send a query at this point. P Either the editors have requested no queries or they do not respond to all submissions (see their guidelines for details). It may be appropriate to change the status to "Rejected" or "Never Responded" at this point. P It may be appropriate to send a query on the status of your submission at this point. Always check guidelines before querying. If you have either need to update a submission's status or you need to correct a mistake, you can use the "Update" link in that submission's row on your report. Editing the information is exactly the same as entering a new submission, except the previous information is pre-filled. Updating multiple entries: If you sent multiple pieces to a market at the same time and you would like to update them in bulk instead of singly, use the "Update" link in the row for any submission that you sent in that batch. The form will include the other pieces that you sent at the same time. Check the box for each piece that received the same response, and click "Update." If some of your pieces were rejected and others accepted, you will need to complete this process twice: once for the ones rejected and once for the ones accepted. Please don't delete a submission entry unless it is an accidental entry or you have very good reason to do so. Remember that the submissions information you submit is included in the statistics we maintain. Deleting a submission affects that data and can give other members misleading information (such as an inflated acceptance percentage). If you don't want to see your rejections, please use the filtering options outlined above. Although we have never lost anyone's submissions information, we cannot guarantee that it will never happen, and we highly recommend that you archive your submission tracker regularly. We provide basic "Export to Excel/CSV" support specifically for this purpose. We hope this information has helped you understand how to report and track your submissions. If you have any suggestions on how we can improve this guide, please let us know.